Has what was designed as an instrument of quality assessment become an institution that risks stifling the excellence it was intended to foster? Have well-intentioned but imperfectly designed frameworks led to wasteful and distorting behaviours, by academics and their universities? When John Allen and I asked very similar questions, we lost our positions at Queen Mary University of London. Stefan Grimm’s death and his post-mortem message to his colleagues have summarised the present state of affairs in the UK academy. “The strongest reason for retiring is that I no longer feel that I work in a university” says an anonymous academic, “today, of course, universities are businesses, with decisions increasingly being made on commercial grounds”. It doesn’t seem to matter that this way of going about is stupid. “One of the grand rituals of British academic life is about to reach its climax.” Thus, starts his commentary Derek Sayer (resonating with the title of this post). The exclusion of several of his colleagues in history at Lancaster University led Derek Sayer to take the unusual step of appealing against his inclusion in the REF. His appeal was not upheld. "Attempts to quantify quality are destined to fail"
with my - now many ex - Queen Mary colleagues. in their numeration." Alas, this joy will not suffice my ambition. Wake up Kemal, this world needs you to change. Breaking news this morning. Jeremy Kilburn quits from his position at Queen Mary on the eve of the REF announcement. Professor Jeremy Kilburn will be leaving Queen Mary in the New Year to take up the role of Senior Vice Principal at the University of Aberdeen. Such developments prompt mixed emotions – pleasure that a respected colleague is advancing his career, but regret that we are losing the services of one of our most senior academic leaders. Jeremy has led the Faculty of Science and Engineering with great distinction, advancing both the quality and volume of the Faculty’s work in education and research. He has also contributed much more widely, for example in providing academic leadership in Estates issues and in major input to the Life Sciences initiative. Jeremy takes up his new post on 1st March 2015. The search and appointment process for his successor begins immediately and I will let you know in due course the interim arrangements that will apply from 1st March. There will be opportunities early in the new year to join an event to celebrate Jeremy’s achievements and thank him for his contributions to QMUL. Zero accountability for the Golden Boys. That was how Jamie Targett, Poppleton’s Director of Corporate Affairs, responded when our reporter Keith Ponting (30) asked for his reaction to a study by a doctoral student at University College London into how the research excellence framework had affected the day-to-day lives of academics. But had he read the bit that said that “for most interviewees it [the REF] creates pressure and stress, producing a decrease in the quality of the research”? “I read that bit,” said Targett. 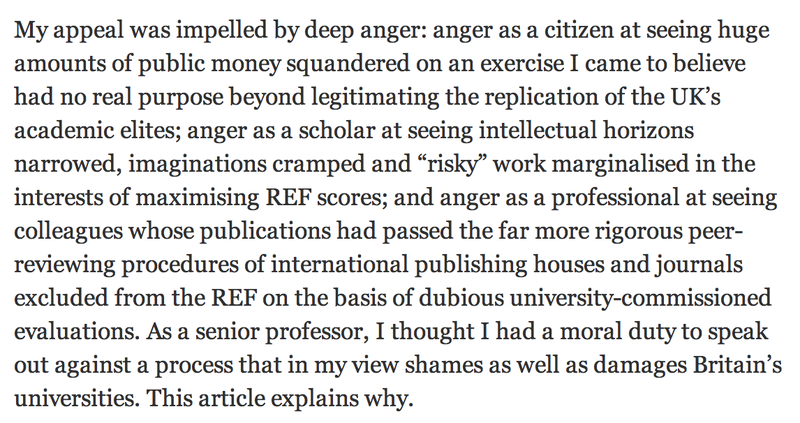 But how about the bit showing that the REF has even led some academics to reduce their research output? And that other bit about how the REF had discouraged interdisciplinary work? So, after reading so many bits of the new research, did Targett now in any way question the value of the REF?